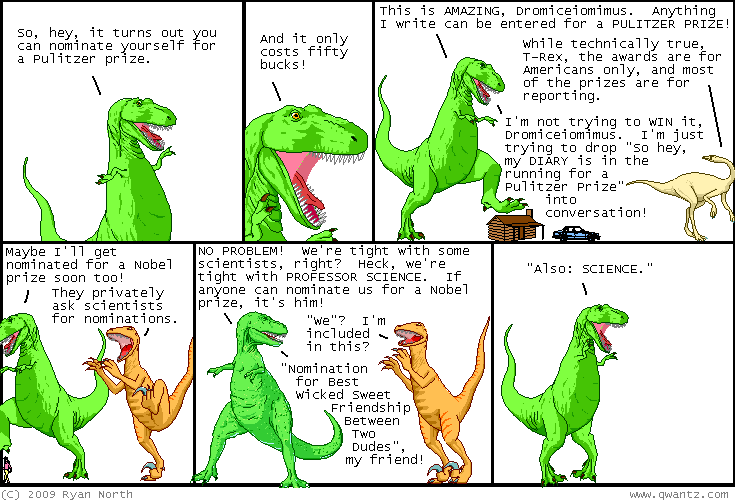 Dinosaur Comics - November 13th, 2009 - awesome fun times! November 13th, 2009: Hey, what are you doing next Friday, the 20th of November? If you're in NYC you should totally check out Art, Advertising, Activism & Alchemy, which is a series of talks by four awesome street artists (including my buddies Posterchild and Jason Eppink!) and also an art show and also it's free, you guys! Posterchild's site has the details and this Facebook group has the details too. Also! There are now HOLIDAY SHIPPING DEADLINES announced. The nearest one is on November 22nd so now is the time to think about presents for your favourite dudes and ladies, dudes and ladies!